BOOM. Another Yager announcement drops, the timpani in E3’s overture. First came Dead Island 2, the unexpected do-over of Techland’s action RPG by the handwringy chaps behind Spec Ops: The Line. 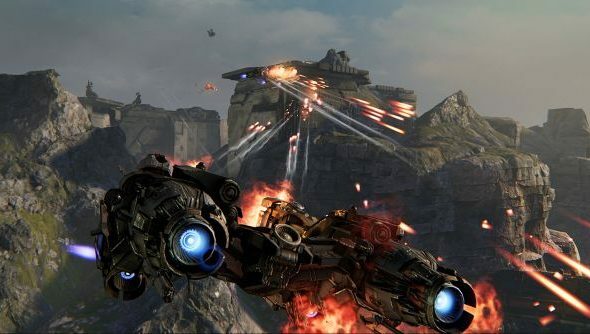 And now this: a futuristic dogfighting game named Dreadnought. Where every other dogfighting game currently in development for PC is set in space, Yager have differentiated Dreadnought by setting it just underneath space. Observe. Brr. Jager seem to be using Dead Island 2 as an opportunity to experiment with gallows humour – while they channel Spec Ops’ chilling disregard for human life into this game about low-flying spaceships. It’s built in Unreal Engine 4, and casts players as the mercenary captain of that great, grim ship in the trailer. Players will assume FTL-like control, rerouting power to different systems and customising every part of their vessel – its weapons, engines, armour, abilities, crew and colour scheme. There’ll be a public beta early next year. You in?